I was cycling to work through the Jan Marais Nature Reserve which is located near the centre of town. As I rounded a corner I was stunned to see a beautiful big caracal standing in the path. He calmly trotted around a bend, watched me for a moment, and then disappeared into the fynbos. Obviously, there was a lack of prey in the mountains and the resourceful cat had quietly slunk through the urban area to feed on the guinea fowl, squirrels, hares and buck that live in the reserve. Now, I have been on a lot of wildlife safaris, but I have never seen a caracal in the wild. And here I see one in my backyard, in town… Nearly fell off my bike. I have kept the sighting quiet because I know how people can react. 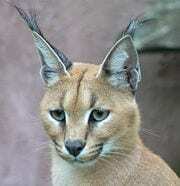 Caracals have been terribly persecuted by farmers over the centuries. I did, however, notify Cape Nature, the local nature conservation agency. I haven’t seen it since, but I am happy to know that it is somewhere out there.